It’s perfectly legal to buy over-the-counter tooth whitening products and use them. But if you pay a nondentist for help in doing so, that person may be committing the crime (!) of practicing dentistry without a license. Kentucky passed just such a prohibition on teeth whitening in 2010, apparently with little-to-no debate. The Institute for Justice’s “White Out” study, released Tuesday, documents that dissatisfied consumers are not the force behind restrictions that shut down teeth-whitening businesses in malls and salons. Overwhelmingly, it is dental-industry interests. Of the 97 complaints about non-dentist teeth whitening provided to the institute from 17 state agencies, only four came from consumers. All four alleged reversible side effects, like gum inflammation and tooth sensitivity. Academic dental research shows that such side effects are common to all forms of teeth whitening, wherever it is done. The remaining 93 complaints came from dentists, hygienists, dental boards, associations and anonymous individuals. They didn’t allege harm to consumers as a result of commercial on-site whitening. 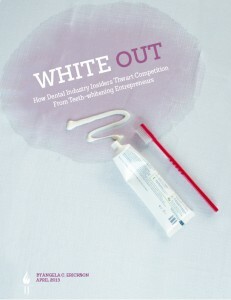 The complaint was that entrepreneurs offering teeth-whitening services are practicing dentistry without a license. As a result of these unlicensed-practice complaints and pressure from licensed dentists and associations, at least 30 states have taken action against non-dentist teeth-whitening businesses. Some of the states have passed new laws or regulations to ban them from the trade. Others have simply reinterpreted existing laws against the unlicensed practice of dentistry. Civil asset forfeiture strikes at the heart of property rights. Authorities simply seize private property without all the messiness of convicting someone of a crime. It’s blatantly unconstitutional and it shouldn’t happen, but it does. What’s worse, many state governments offer little to no information to the public about what they’re doing with those ill-gotten gains. A new report and video from the Institute for Justice illustrates the case of Georgia quite well. The video was produced by IJ’s multitalented Isaac Reese.